Student representing International / National / State I Zonal level competition for the above mentioned sports from last two academic sessions. Student must qualify in game trials, skill test & fitness test conducted by PE 'department and to be recommended by Sports Committee. 'The student must clear Academic Entrance Test conducted by School with minimum passing marks. Verification of all original documents & certificates of the student will be done. Sports Committee will forward the names of students for Sports Merit Scholarship to the Pro Vice Chairman sir for final selection. The child who qualifies for the sports scholarship has to participate in all competitions where school team participates. If the child refuses to represent school team except on medical grounds then the scholarship will be withdrawn completely with immediate effect. For continuation of scholarship the child must achieve the same achievement based upon which the scholarship was given. If the child fails to achieve the same result / achievement for the school team during the period of scholarship, his scholarship will be withdrawn or curtailed. The child must secure minimum 50% marks in school annual examination. If the Child fails in a class then the scholarship will be withdrawn. Continuation of sports scholarship in the third year will purely depend upon Student's performance for last two years and recommendation by Sports Committee. 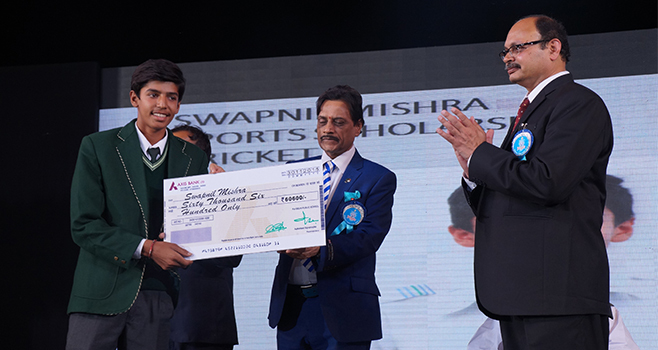 Parents to give an undertaking that in case his child is unable to maintain performance level according to the sports policy, the scholarship offered will be fully withdrawn. In case of withdrawal of scholarship, full fees will be payable by the student / parent, including admission fee for newly admitted students. The parent will have to attend the meeting in the school to discuss the Sports and Academic performance of his ward. Minimum of 50% attendance to be maintained by the student in the school. Medical treatment or expenses towards sports injury to be borne by the Parents. All legal cases to be settled in Bhopal district court. Freeship / Concession in fees as per details in Annexure - I.
Remedial or special classes for the players during off season and vacations. Special policy for grace marks in academic results. Attendance will be given for participation in recognized tournaments/ competitions / coaching camps on the recommendation of HOD, PE. Specially designed sports kit & track suit will be given to student. Air fare will be given from School's side for International Level Participation. The student will have to pay for uniform, books and stationery. The student will have to pay for bus fee, uniform, books and stationery. External student – two years of achievement.